Richard Lagow, a true freshman quarterback from Plano, Tex., tweeted that he is leaving UConn and headed back home. "I am headed back home and wish the players I met the absolute best," is part of what Lagow posted on his Twitter account. UConn confirmed that Lagow has left the team with the intention of transferring. UPDATED 8/21: ESPN's Damon Sayles among those reporting that Lagow has landed at Oklahoma State. Lagow was seeing regular work as one of five scholarship quarterbacks in camp but with Chandler Whitmer entrenched as the starter, redshirt freshman Casey Cochran and true freshman Tim Boyle appearing to be fighting it out for the No. 2 quarterback spot, Lagow will look for another school to play for. "My position on the football team is adequately stocked and I know I can leave and not feel I have let down the team," Lagow also said in the note he attached to his Twitter account. With Boyle decommitting from Boston College and signing with UConn and the Huskies also signing Kivon Taylor, Lagow delayed signing with the Huskies before finally signing his letter of intent. UConn confirmed Lagow's departure through the UConn football official Twitter account.. Ironically UConn coach Paul Pasqualoni mentioned Lagow when he was asked about the battle for the No. 2 quarterback spot when he spoke at the Middlesex Chamber of Commerce monthly breakfast earlier today. "Casey Cochran right now is mentally a little bit ahead," Pasqualoni said. "Timmy Boyle is working in there, Kivon Taylor, Richard Lagow I don’t know if I have ever been in the situation where I signed three quarterbacks and all three of them are really good players. They are all big, they are all 6-4, 6-5, they all have strong arms and all have a very good throwing motion. We don’t have a windup guy in there. We have guys who can put the ball into tight places and can throw the ball around the field." Judging by the way the reps were handed out at Saturday's practice Boyle seems to have distanced himself from the other true freshmen while Taylor offers the added dimension of being a dynamic athlete who could ultimately be used as a quarterback in the wildcat formation but has shown the passing skills to develop into so much more. 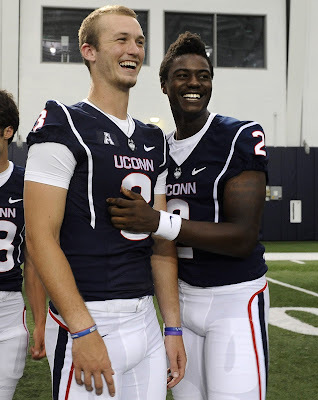 As Lagow mentioned in his tweet, UConn is well stocked at quarterback so his leaving the team will not leave the team's strength at the quarterback position. Lagow's departure could open up a scholarship slot and it will be interesting to see if the Huskies look to fill it immediately. Jalan Branford, a defensive back/receiver from Reading, Pa. and Chris Britton, a linebacker from Harrisburg, Pa. were both expected to enroll at Fork Union before arriving at UConn in January but Fork Union postgraduate football coach Col. John Shuman said in an email to me earlier this afternoon that neither of the players have reported to Fork Union yet.